An extract from 'The Passion of Life - Essays on art, dance and theatre' by John Turner. John Turner begins this book by exploring the deeper underlying causes, reasons, and applications of art, dance and theatre throughout human history. The book then continues with a section on World Theatre which looks at the art of different cultures from this viewpoint. This extract is taken from that section, and concerns the Theatre of Japan. The theatrical form of the Noh plays had its flowering in the fourteenth century, and yet its roots were established some centuries before within the sacred temples and courts of ancient Japan. The word 'Noh' translates to 'accomplishment', and rather than simply being a means of depicting stories for entertainment, the highly skilful art of the Noh players was one of capturing and representing influences and imageries through beautiful and exact mime, dance, music and chanting. The players enter in ceremonial fashion across a bridge, the ancient hashi-gakari, representing the journey from one world into another, from the spirit worlds into the material worlds. Placed alongside the bridge are three pine trees, trees which are natural insulators in that they absorb any low level energy that is in the neighbourhood. Japanese theatre is a theatre of economy, exactness, functional response and the meeting of exact requirement. The movements are precise, small, neat and powerful, each gesture an image, each posture a statement, each movement a story. And in the way of the nature of red, the theatre provides an arrangement with outer order and discipline, whilst housing an inner passion - contained, potent and released only in moments. In our modern world we measure all and everything from living within an environment of multiplicity, of noise, mass and randomness. There is ceaseless sound, impressions incessantly bombarding our senses, and movements are continuous with little pause. Thoughts flash through our mind like tickertape, sensations are so rapid and variable that the whole bodily system, including its many inner lives, becomes either anaesthetised or exhausted. There is little quiet, inner settlement and peace. So it is difficult to imagine a world and a time where a note or sound might hold in the air for a minute, and where the vibration of that sound might resonate through every chamber and part of the listener; where a single movement might change the atmosphere, and where the air is so conductive that a gesture could transfer a state or feeling or a knowing; when a thought magnified by a movement or posture might evoke a state that could cool the blood of those assembled; when a small gesture with the right hand would send a wave of anticipation through the court in readiness for the next moment or next act. * Note: The study of movement to the right and left needs to take into account the two hemispheres of the brain, in which movement to the left is controlled and governed by the right portion of the brain and vice versa. The right side of the brain is creative, artistic, soft, feminine, abstract inclined, whilst the left side is logistical, reasoning, academic, masculine, hard, definition inclined. This is an ongoing research which can reveal much understanding about classical dance, using the inclination of the head in oratory to place different emphasis upon what is being spoken, to condition oneself in preparation for particular work, and so on. A dance to the right would have one effect, to the left another *). And as the dances passed down from generation to generation, and as the roots and motives of the theatre became lost, so the dramas became fixed and ceremonial, when once they were spontaneous and live, performed by accomplished, trained, instant, free responders. Bugaku is the name of one of the forms of dance that has come down to us over time, passed down through successive generations. It is a masked dance performed originally in the courts and temples. The dances were divided into two types - Dances of the Right, where the dress of the dancers is predominantly green and the music primarily played on percussion, and Dances of the Left, where the dancers dress primarily in red with music played mostly on woodwind instruments. Might it be that the Dances of the Right were to do with propositioning the future, whilst Dances to the Left were to do with evoking from the past or capturing something in the present? The original meaning of these dualistic natures of dance can begin to be understood through the esoteric understandings of colours, symbolism and electro-magnetism. In this, green and red, like the modern traffic lights, represent two human states of readiness and response; the one, green, is full of vibrancy, liberation, fertility, spontaneity, insistence; the other, red, is contained, cautious, entrenched, fixing and maintaining. These two colours were possibly the translation in those times of a duality that plays itself out in all world theatre, in other times reflected by the difference between silver and gold, and the difference between the two hands of man, the right and the left. ** Note: The word Shinto carries a meaning of continuity. Japanese music works to create a state of continuum, in which the percussion instruments speak to the brain, whilst the flute, with its intrinsic nature of longing, reaches out to the soul. Likewise the percussion instruments of the Japanese movements carry a vibrant procession of individual and varied sounds, whilst the woodwind instruments convey the nature of a smooth changing continuum like the waves of the sea. ** So we have the difference between granulated and viscous, of electric and magnetic, of cooling and heating, of loosening and binding. This is the dualism at the heart of the theatre of the planet we live upon, demonstrated most obviously in day and night, winter and summer, and hot and cold. All theatre and art appearing here is governed by this dualism. 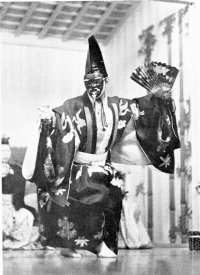 The Bugaku dances became interwoven into the fabric of Noh drama in a time in history, the fourteenth century, when education was flowering throughout the world, and liberation and an evolution of the intellect and spirituality were taking place. Theatre in Japan, similarly to elsewhere, began to take on an educational role, evolving out from the temples and religious places into the streets and market places. Noh theatre is the art of simplicity, of subtlety and finesse, of suggestion and gentle gracefulness (yugen). It evokes states and atmospheres, and it calls upon those who witness to enter into its world wherein a simple spiritual message can, like a virus, be contagiously transferred. What is interesting is that there are never rehearsals for the Noh dramas. Each actor knows his part and the drama thoroughly, but each performance is live with the subtleties of that particular day and all the elements that make up that time and space. John Turner was trained as a theatre director and has lectured internationally in theatre studies. He continues to research and study Template Theatre and Art with the wish to one day establish a Template Theatre School.